The purpose of the dragonfly is to catch and eat mosquitoes. They are aerial predators and very precise in calculating distance, speed and connecting with their victim. The mission of the feng shui consultant is to re-direct a person’s intentions so she will reach her goals in life or become more aware of how to heal. According to Andrew Handley’s article on The 10 Surprisingly Brutal Facts about Dragonflies, the dynamics of capturing an object in mid-air are staggeringly complex, so much so that it’s usually something that’s only done by animals with complex nervous systems, like seagulls, or humans. To intercept something moving with its own velocity, you have to be able to predict where it will be in the future. When researchers began studying dragonflies in 1999, they found that rather than “track” their prey—follow it through the air until they caught up with it—they would actually intercept it. 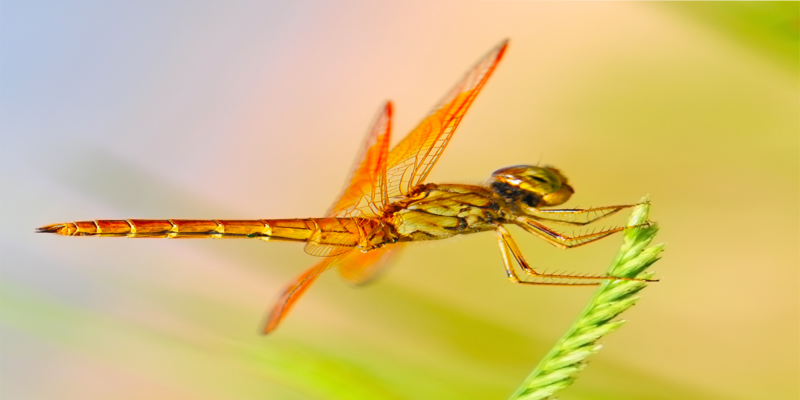 In other words, dragonflies ensure a kill by flying to where their prey is going to be. What in the world does this have to do with feng shui? Well, a good feng shui consultant’s goal is to intercept a client’s life when it is moving in the wrong direction related to a person’s intentions. Feng Shui consultants intercept and, instead of flying to you like a dragonfly would to their prey, they open pathways for you by helping you see the roadblocks and the symbols that keep you there through their repetitive message in your space. They then provide a new and exciting direction for you to travel in your life. If you are my client, after a meeting with you and a comprehensive questionnaire completed, I’m able to identify the real problem that prevents you from moving forward. Your personal space tells a story about your past, your present and where you may or may not end up. Dragonfly eyes are incredibly advanced. They have 30,000 individual facets and each facet creates its own image. Their brain neurons compile those thousands of images into one picture. Humans do the same thing. The whole picture of our stuff that surrounds us in our spaces compiles all those images into one message. That message is communicated to us daily. So ask yourself: “What message do I want to send to my future to realize my life-long intentions?” If it’s clutter you have and have had for years, then you are looking at your future. If it’s a health issue that continues to plague you, what in your environment is communicating this negative message to you? Has your posture taken a wrong turn? Maybe everyday you are looking at a picture that implies slumped shoulders. I once has a client who lived across the street from small hills. I was standing slightly behind her and noticed that her posture mirrored the hills she looked at daily. I pointed this out to her and she realized that this could be what is going on. She didn’t have the back aches until she and her husband moved there. It can be as simple as that. Feng shui is another tool in the law of attraction. You get what you process through your many sense. Ask yourself what conversations go on in you mind when you view your pictures and the sit-a-rounds in your home? Everything you say, think and see, hear, smell, and taste is processed on a molecular level in your body and messages are sent to the brain. Your physical environment is connected to your health. How does your personal space set the stage for you to move forward in a positive and healthy mindset? A practitioner from the Feng Shui Institute of America, a.k.a. Pyramid or Scientific School of feng shui has eyes that see many facets of a client’s physical environment that tells a story of “why” a client isn’t happy with where decisions have taken her. We compile the multiple images we gather, tie them in with the answers given by the client, analyze the symbols of the space and are then able, just like the dragonfly, to make a decision to correct the trajectory of a person’s life to match the intentions they want to achieve. Become an expert in the field of scientific feng shui by enrolling in our certification course. Contact us today for more information and please join our Free Content Library to access feng shui training for your own home.